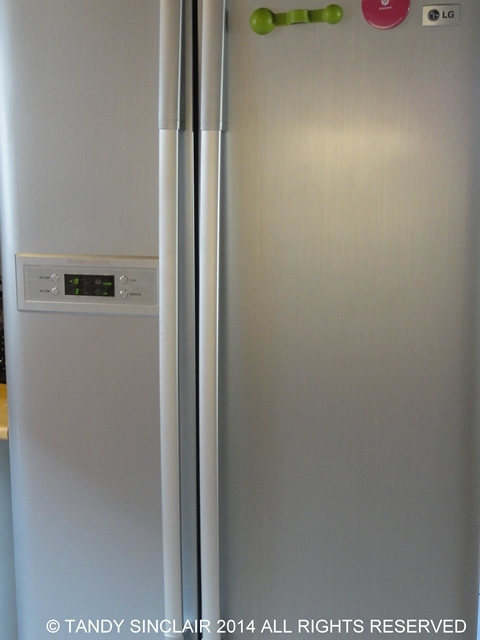 The first major purchase you will make for your kitchen will be a fridge. When I bought my first fridge I expected to be single forever and so used that as the basis for what size fridge / freezer I needed. I decided to get an upright combination and if you go for this, make sure the freezer compartment is at the bottom. Once Dave and I had settled in to married life, it soon became apparent that my fridge was just not big enough and so we bought a side by side unit. Here I would advise that you do not get one with an ice maker or water dispenser. These take up so much of your usable space and frankly in my opinion the loss of space is not worth the addition of ice. Once you have made a decision as to what size and style suits you, it will be time to go on your first shopping spree. I always have eggs in my fridge. I buy free range farm eggs from a local supplier. If you don’t have the same luxury do still try and get free range eggs. Next must have is butter. I prefer unsalted butter but I know this is down to my preference and most people I speak to use salted butter. I also always have cheese and bacon – so as you can see, breakfast is waiting in my fridge in the form of an omelette. In our ‘main’ fridge I keep a variety of soy sauces and soy based sauces. I also keep pure lemon juice and lime juice to use when fresh is not available or when I just need a dash of juice to make a dish or my water taste better. I keep wasabi and horseradish and a lot of different mustards. And my own home made mayonnaise and a variety of salad dressings. You will also always find tomato paste and anchovies in my fridge. On the sweet side I keep jams and marmalade as well as UHT cream for dessert emergencies. Even though we do not have milk in our coffee, I keep a couple of boxes of UHT milk. I only buy the one from Woolworths as it is the closest taste to fresh milk than any of the other brands we have available. Crème fraîche or sour cream is another essential as it goes into all sorts of sauces and mash, whether I use beans or potatoes or another vegetable to make the mash. I also have yoghurt in my fridge for weekend breakfasts and baking. I have a slight obsession with pickles and there will always be a variety of them in my fridge as well as a container of home made stock. I keep all my vegetables in one drawer and am never without tomatoes and mushrooms. In the other drawer I keep fruit as well as fresh lemons and limes when they are in season. Of course, no fridge would be complete without wine and I keep open bottles of champagne, white and rosé wines in my main fridge and spare bottles in the second fridge. 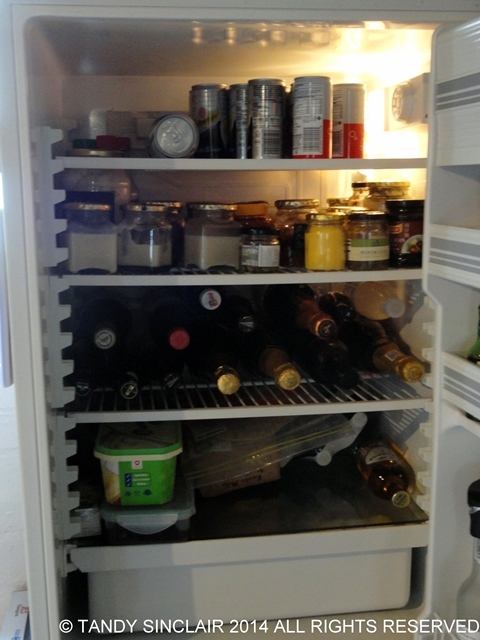 In that fridge you will find all my alcoholic beverages that need to be kept cold as well as cold drinks. Cordelia sleeps in there snuggled between my ‘fats’ (lard, duck fat, ghee etc.). I collect condiments and amongst the bottles I have capers and sauces. I also store my flour in the fridge, only decanting 500g at a time for my small pantry. 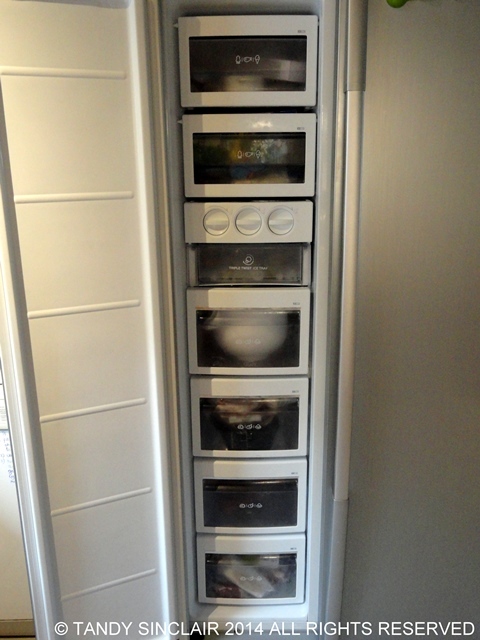 The smaller freezer is used for pastries, fish, ice cream and vodka :). In my other freezer I keep meat, chicken, stock, bread rolls, lots and lots of egg whites from making ice cream. Every couple of months I donate these egg whites to my cousin who makes pavlovas. I always have peas in my freezer as well as herbs. I keep my toasted pine nuts and pomegranate arils frozen for when I want to make pesto or ‘tart’ up a salad with some red jewels. I have an ice tray that freezes three trays of ice at a time, and a drawer underneath it to store the ice. In this drawer I keep fresh root ginger as well as lemon and lime wedges. I have made bold what I think is essential for a first shop, but of course that will depend on your diet and palate. My fridge contents are ever evolving as I continue blogging and developing recipes. I hope this helps! Totally agree with you about having the freezer at the bottom and fridge at the top. Since we went to that style of fridge, we have never been back. We are getting a new kitchen next year and tempted as I am to get a pigeon pair, I think that it’s too much for the two of us and that I will just be tempted to stockpile even more. 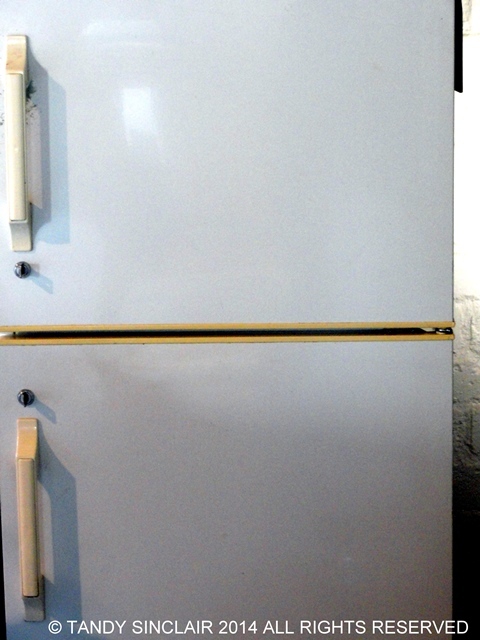 We will be buying a bigger fridge though as very a very restricted in space at present. Some great tips again for those starting out or moving away for uni etc. Haha… My first fridge was big, his name was Bruce. A total legend he was, didnt matter how much I cooked, he’d store it all for me perfectly. I sold Bruce last year and upgraded to Maverick (I have boy fridges) that is HUGE! 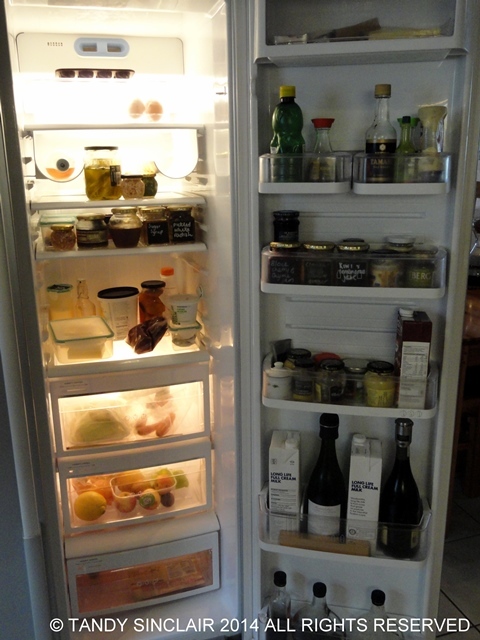 Love how organised you are, you can a lot from someones fridge. Love that you name your fridges! wow Tandy, I would never be so bold as to put photos of the inside of my fridge on my blog! Your fridge is so neat Tandy! We only have a small space for our fridge and we wanted one as big as we could get. Luckily we found one model that fit! Wow! Tandy, you are so organized, that makes a lot of sense to combine certain ingredients in certain areas, I am always looking for things in mine. Great tips! This does help, Tandy! Sometimes we do impulse buying without prioritising the essentials. Having 2 fridges definitely helps! My mom and dad refused to get rid of their smaller one when they got the new big one. Helps a lot when you have people coming over for a braai, or want to defrost the bigger one. Your fridge is gorgeous! Can’t wait to have one like that one of these days. My husband and I still have to make our first fridge purchase as we inherited my grandma’s fridge when we bought her house. Totally agree on the free range eggs, pick them up at roadside stands when available. Bacon. Have that cooking on the stovetop even this minute. You’re really getting me to think about the ice maker! We always thought we really would want one, especially when entertaining…..but maybe the space is more valuable. I can’t wait for the day when I live in a real apartment and can choose my own fridge! Tandy, you a so cute and you always make me laugh. ” I have a small freezer for icecream and vodka, of course…” ha ha ha…Your refrigerator looks massive compared to my apartment sized one. We have to get provisions several times a week here as with 2 hungry teenagers, I can never have enough supplies to hold them for the week.